Parchment paper is coated with silicone to make it non-stick, making it difficult to recycle. It is also frequently contaminated by food, oil and grease. The box that the parchment paper comes in is perfectly recyclable. You’ll just need to remove the little strip of metal teeth before you break down the cardboard to be recycled. 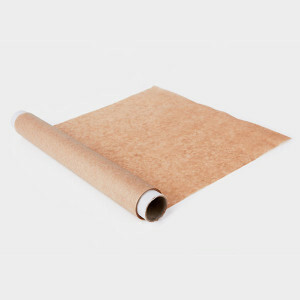 If you use parchment paper, look for brands that offer unbleached paper. The paper bleaching process is often toxic, using chlorine and releasing dioxins, residues of which can remain on the paper. Silicon baking mats are a safe alternative to parchment paper, and they are reusable up to 3,000 times.